Green Home Builder: What were some of the highlights thus far in 2018 for the Solar Technologies Office? Dr. Becca Jones-Albertus: In April, we issued a $105-million funding opportunity, one of the largest we have ever released. This will fund about 70 projects that address the affordability, flexibility, and performance of solar technologies on the grid. This expands our office’s research portfolio for advancing both solar photovoltaic (PV) technologies that use semi-conductors to turn light into electricity and it also addresses the more common technologies, which are in cells on rooftops, as well as concentrating on solar-thermal technologies. These are typically much larger plants, they operate more like conventional plants taking solar energy and converting it to thermal energy that can then be stored and used basically on demand. We are funding technologies that facilitate the quick integration of PV and CSP (concentrated solar power) into the nation’s electricity grid, and we are looking at how we can support efforts to prepare the workforce for the solar industry’s future needs. Our workforce projects will support veterans who are entering the solar technologies industry, expand the number of participants in the industry, and prepare those in the utility industry to manage a modernizing grid which is incorporating more and more solar all the time. We also recently announced the American- Made Solar Prize, which is a competition with a $3-million dollar prize that is supporting entrepreneurs to develop transformative technology ideas into concepts and early stage prototype developments that are ready for industry testing. It is a very exciting competition that we just launched and we are hoping it will incentivize innovation in the solar industry. GHB: What are some new solar technologies that you are most impressed with? What proposed solar advancements are you keeping an eye out for? BJA: We’re very interested in advances in materials science. We are planning a number of efforts that are looking to enable solar energy systems to last up to 50 years while continuing their cost reduction; so even as they get less expensive, they will have a longer lifespan. One technology we are funding that might be of interest is actually looking at taking low-cost PV technologies and incorporating them into windows. The windows would be transparent, and wouldn’t use any of the visible light that we see, but would take other parts of the solar spectrum and turn that into energy. There are a number of interesting approaches to incorporating solar into windows. GHB: California has mandated that all new homes will be required to have solar panels by the year 2020. Any input on that? 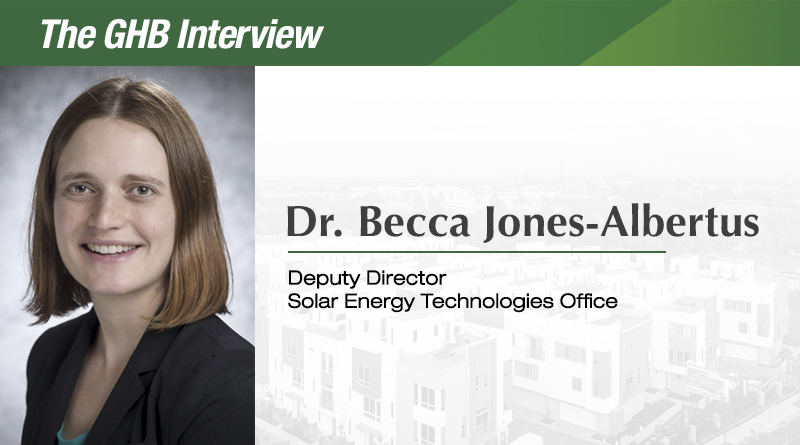 BJA: I can tell you that last year we put together a number of resources for homebuilders and homeowners who are considering adding solar to their homes. They are on our website at www.energy.gov/eere/ solar/homebuilders and may help your readers better navigate some of those challenges. They include resources on how a home’s value changes with a solar system on it, since homes with solar do sell for more than homes without it. We also have some resources on financing options and how it works to sell a home with solar. We have multiple things on our website that might be of interest related to this issue. GHB: What are some changes that you think still need to be made to our laws regarding sustainable energy? BJA: The process of going solar across the country, which can include adding solar and storage, does take a lot more time, and is more expensive due to all the red tape and a lack of streamlined processes. Within the U.S., there are 18,000 jurisdictions and 3,000 utilities in 50 states that all have different rules for how you go solar and how you incorporate solar and other technologies in your home. We have programs, like our SolSmart designation system, that provide an increased standardization across the country to help communities streamline their processes and make it easier to go solar. GHB: How is the Solar Energy Technologies Office working to address the affordability and accessibility of solar technology for homes and businesses? BJA: It has long been our mission to bring down costs and make solar more affordable. In 2011, we launched our first set of cost targets to drive down the costs of solar energy systems by advancing technology, standardizing processes, and providing information resources. With our help, the solar industry reached cost targets in 2017 for utility scale solar, which is a very large solar use system. They reached six cents per kilowatt-hour. We have since then built and announced new costs targets for 2030. The more that we continue to drive down costs for technology innovation, the more affordable solar becomes. GHB: What will Solar Energy Technologies Office be focusing on for the rest of the year? BJA: We will be busy choosing the most impactful projects for our $105-million funding opportunity and will be supporting the work of the National Renewable Energy Lab and the American Made Solar Prize. Those will take up a lot of our time. We are continuing to focus on the next set of priorities and challenges. One priority for us is looking at the challenges of incorporating solar on the grid and how solar can be coupled with other technologies to enable a better of supply of energy when it is needed, not just when the sun is shining. GHB: Tell me a bit about the duck curve and how you are working to address the challenge it represents. BJA: The duck curve is the first curve; people have developed some other curves as well. The duck curve is the most talked about in California. Essentially, when solar generates most of its energy in the middle of the day, it actually can produce so much electricity that, when you couple it with baseload generation, you get to a point where you have almost more electricity than people are using. Some of our peaking generators would not be in use at all, but when when the sun is setting and electricity needs are peaking, our other generators need to ramp up their generation very quickly to meet this load. They are going from a lower level of usage due to all the solar, to an increased demand and less solar, so the next load that needs to be met by generators other than solar has a very sharp ramp. It’s the kind of thing that hasn’t been seen before, which is a challenge for some operators. This is an opportunity for new technologies that help people with storage, or new ways of using energy when the sun is shining. We are working on it in a number of ways. One of the ways is looking at how solar can couple with other technologies to make it a better match for when electricity is needed. The simplest way is to store some of the sunlight when you have too much in a battery or another form of storage, and then, when you have all the demand at night when the sun isn’t shining, you use that stored energy. CSP technologies do that in an integrated way. Basically, before they generate electricity at all, they store heat and then use it at times when electricity is needed most. So they might generate electricity only when the sun is not shining. We have a lot of money in concentrating solar technology power for that reason, in addition to looking at PV solar coupled with other technologies. There are some technologies that take a look at when you heat your hot water heater and match that to when the sun is shining.